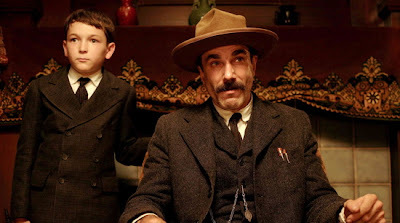 As a film buff, it pains me to say that I've yet to see Paul Thomas Anderson's Oscar-nominated There Will Be Blood, but on the eve of this Sunday's Academy Awards I wish it luck. Not only because it's up against some stiff competition in the form of the Coen brothers' No Country For Old Men, but because it's responsible for the most hilarious rant I've ever seen in film or otherwise. You all know about Daniel Day-Lewis' brilliant bit of insanity by now. "I drink your milkshake! I drink it up!" is now a part of the pop culture lexicon. Thanks to YouTube, I've seen this infamous scene in which Lewis' Daniel Plainview taunts his beaten foe and his young competitor Eli in its entirety, and while I'm sure I've gone and spoiled the entire movie for myself by watching it (over and over again), that one scene makes me want to see that film more than any commercial or positive review ever could. The scene is just so perfectly demented, even if I did view it out of context. Plainview explains his milkshake allegory so well, and while it's clearly a reference to oil drilling (and "draaaaaaaainage," evidently), you can apply the term to just about any form of competition. The scene also shows Plainview chucking bowling balls at Eli while shouting "I told you I would eat you." It's almost poetry. Normally I'd provide a link to that copyright-demolishing piece of footage, but I'm sure the YouTube gods are planning on removing it from the site if they haven't already by the time you this. The film itself is more than the milkshake line. You need to see the evolution of Plainview's madness.